Araucaria bidwillii Bunya Pine or Bunya Nut Tree is a tall growing tree to 40m originally from the rainforests of Queensland and New South Wales, but now widely grown around Australia. This is no ordinary pine tree, it is long lived and is probably not the best tree to sit under. When it does produce its cones they are huge, weighing up to 10 kg. These are an ancient species and have spikey foliage, once they get into ‘nut production’ they are valued for food. In cultivation height is usually around 25m tp 35m depending on conditions. They do make an excellent potted specimen and will grow indoors, as they do not drop much foliage they are ideal for this. The large cones will drop their seeds and they are said to taste a little like chestnuts. 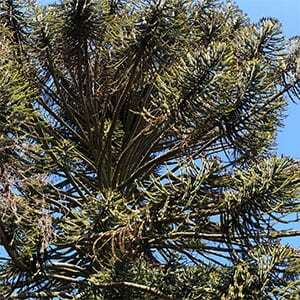 Common Names – Bunya Pine. Height – To around 35 metres sometimes smaller. Spread To around 15 metres in larger specimens.